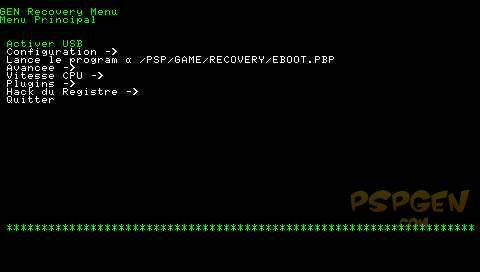 This Custom Firmware runs on PSP-3000 and PSP-2000 v3 and allows you to play with all games even protected ones on your PSP. We finally arrived at our second release of the 5.03 GEN Custom Firmware for HEN and we are happy that there are so many people waiting for a second release. The initial 5.03GEN-A for HEN release which is already a few months old, allowed you to experience homebrews on your psp-3000 devices. Our 5.03GEN-A custom firmware has been used throughout the world, which even resulted in a special psp-3000 packaging in China. (Insolite : des packs PSP 5.03 GEN en vente en magasin en Chine !). However, this Custom Firmware had a real problem, which started to be difficult for users : iit was limited to the games that needed a firmware 5.03 max. This new version will always be compatible with official 5.03 firmware functions and will always allow 5.02GEN-A features BUT with now the ability to play with all games, even protected ones such as Evangelion, Fullmetal Alchemist… just like our new 5.50GEN-D2 does. * 5.55 + UMD/backups compatibility. The Custom Firmware 5.03GEN-B works fine and has a good stability. During our tests, We never met any freezes or any problem with 5.55+ games and protected ones. We are now on the final beta test period which will take one week. This delay gives our newsers the time to prepare good tutorials and videos to support a proper launch. 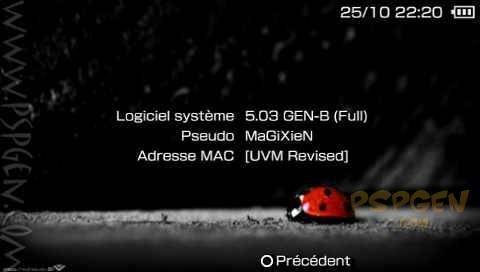 We will release the Custom Firmware 5.03GEN-B on the Halloween day (october, 31).